Inventor Jess Baker with spinning turbine blades in the Wire apartment building in Omaha. This month a transparent tube topped by a turbine will be installed along the side of a Minneapolis grain silo in an effort to create electricity from wasted heat. The 7.5-foot diameter tube – called the Energy Column – captures ground level air that rises to power a 3 kilowatt (kW) turbine. The Minneapolis project will be the second column by GRNE, which piloted the concept in The Wire Apartments, a former telephone company headquarters in downtown Omaha that has been transformed into apartments. Wall and GRNE are sharing the cost and the power the turbine produces will be used on the property. Another silo project by GRNE will soon be underway at a Nebraska agricultural co-op. The company is closely watching the progress of the column in Omaha, about the size of an elevator shaft, said Peterman, who has an industrial engineering background and once played professional football for the Chicago Bears. The building just opened, so no long term data is available, but two turbines that have been installed can collectively produce as much as 3 kW. The goal of Omaha project is as a pilot to see how well the column works and how much energy it might produce. “We need to validate that number and to study the difference between having the column inside a residential building compared to outside a grain silo,” he said. Greg Rothermel, property manager of the 300 unit building, said when he first heard about the Energy Column he was skeptical. The renovation had been tough enough. To break up the half-block building the company created an atrium that served perfectly for the project, although the first proposal called for it to be on the exterior, he said. One end of the column starts at a loading lock area where it captures outdoor air warmed by the sun and the building’s “natural” waste heat. The air flows through one turbine attached to two generators at the base. Within the column negative air pressure creates pressure that turns the turbine. The air continues on before exhausting out a vent in the roof. 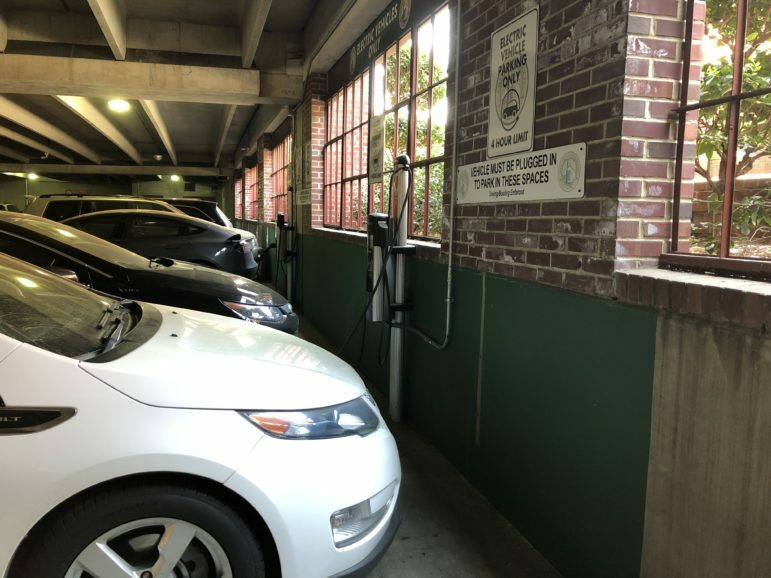 GRNE paid for the installation and added some information for tenants and guests on how the Energy Column works on a first floor storefront that looks into the atrium. Not any building can host an Energy Column. They must be at least 10 stories, or 100 feet – the Omaha project height stands 136 feet. 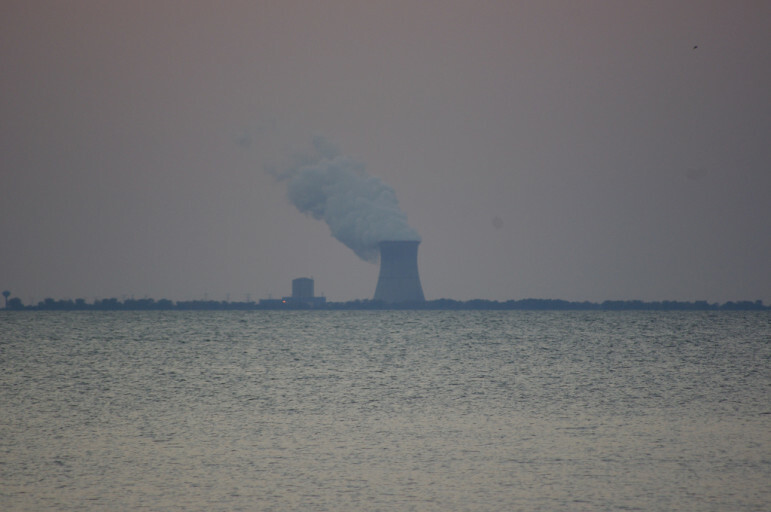 Again, Peterman hopes through testing to see the number of stories required come down enough that smaller buildings could still see results from having a turbine. 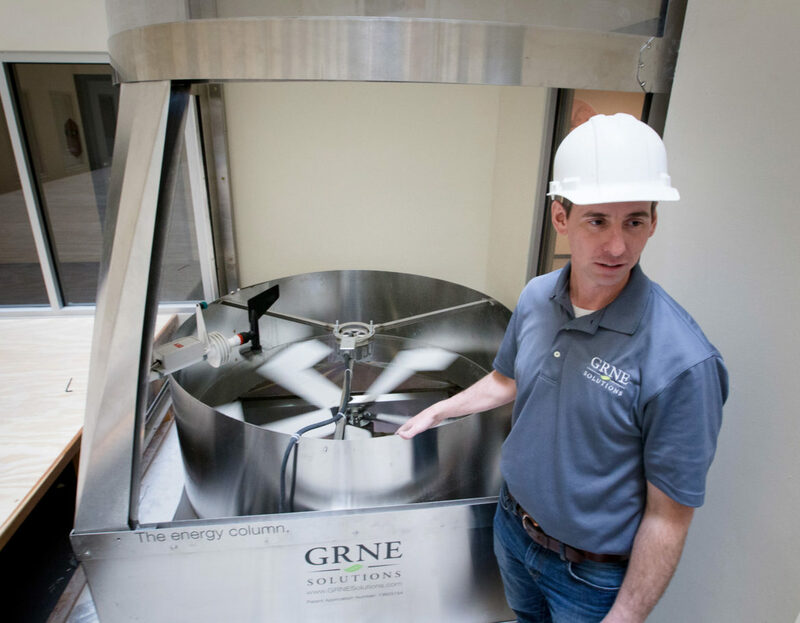 The turbines themselves are custom-made by GRNE to fit into the Energy Column. The column is circular and constructed of clear poly-carbonate wrapped in metal framing, he said. The idea for the Energy Column came from Peterman’s partner, Jess Baker, a contractor who noticed the stack effect on many projects. Capture that air rising and air pressure differentials and energy could be generated through an enclosed turbine, he figured. 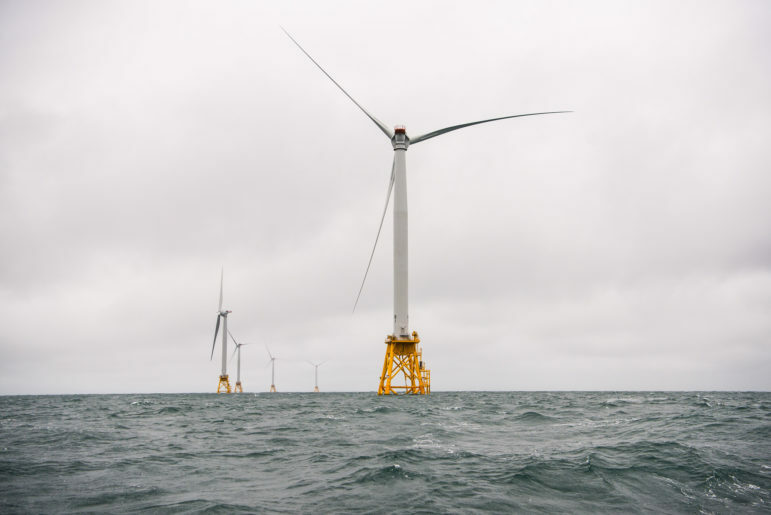 In fact, it’s a more controlled environment than an outdoor wind turbine subjected to occasional violent swings in weather and turbulence, Baker pointed out. A louvered intake vent releases air whenever the wind blows a bit too strongly, Baker said. 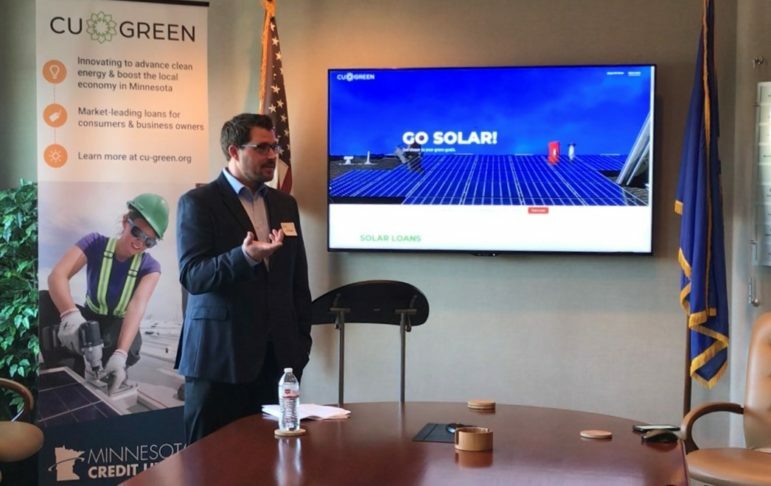 Marketing consultant Bill Shadid worked with GRNE Solutions on the Energy Column during the Cleantech Open Midwest in 2015. The company was a semi-finalist in the contest and won the Sustainability Award for the Midwest region, he noted. The technology probably works better at this point attached to grain silos, he said, followed by structures with atriums. A typical building might require additional duct work to capture rising heat and funnel it through turbine, Shadid said, a cost that few property owners will likely absorb without a significant payback. Or, an elevator shaft, minus the elevator, might work, Shadid said. New buildings could be designed with an Energy Column in one area, preferably on the outside of structures, he said. Work begins June 6 on the column, and Minnesota may be an ideal place for it. “We see greater air flow in colder temperatures – when it’s cold outside you can create a greater difference with the air inside the column,” Peterman noted. It’s also a more ideal setting for optimizing the column’s energy production. 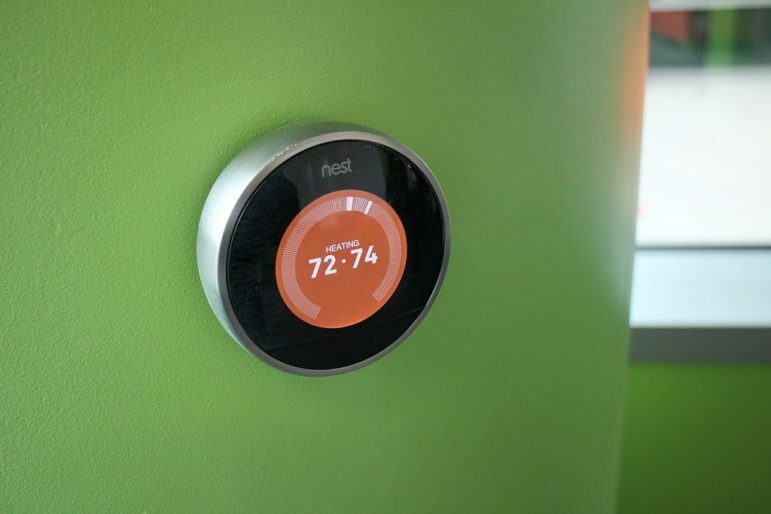 It will be more open to outside air, sunlight and “other factors that can increase air flow,” Peterman said. GRNE may add turbines inside the Minneapolis column to see if more energy can be produced beyond the 3 kW. There’s potential, too, to add more columns to generate more power, he notes. With the Energy Column still in the research and production phase going first to the agricultural community makes sense, added Baker. The barriers to entry are fewer and adding a column to a silo is much less disruptive than to an existing building. Should the column prove itself, the company’s website points to more than a few potential applications – server farms, parking garage ventilation, grain elevators and waste heat recycling. For Baker, a successful product could have a have great impact. 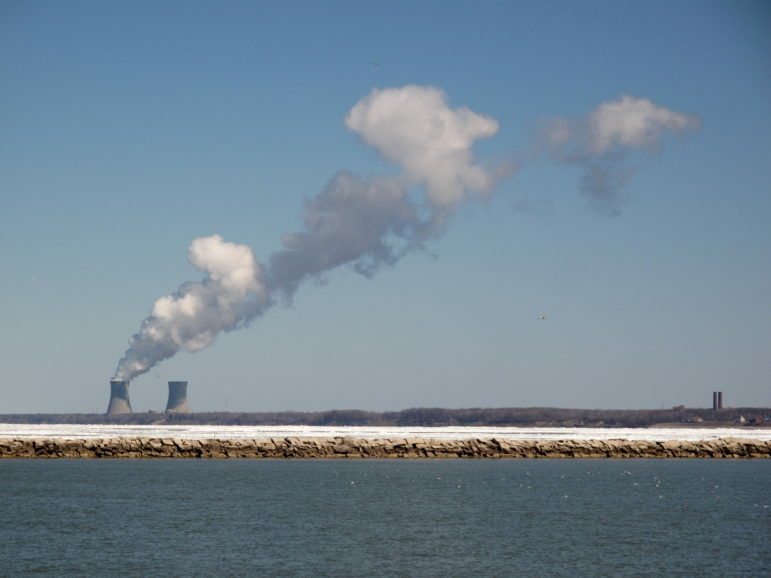 “In order to change the energy climate overall we need to do a better job as an economy and as a society in finding these fringe ideas that will drive us forward toward more renewable dependency in the future,” he said. Can this online startup change how companies buy renewable power? 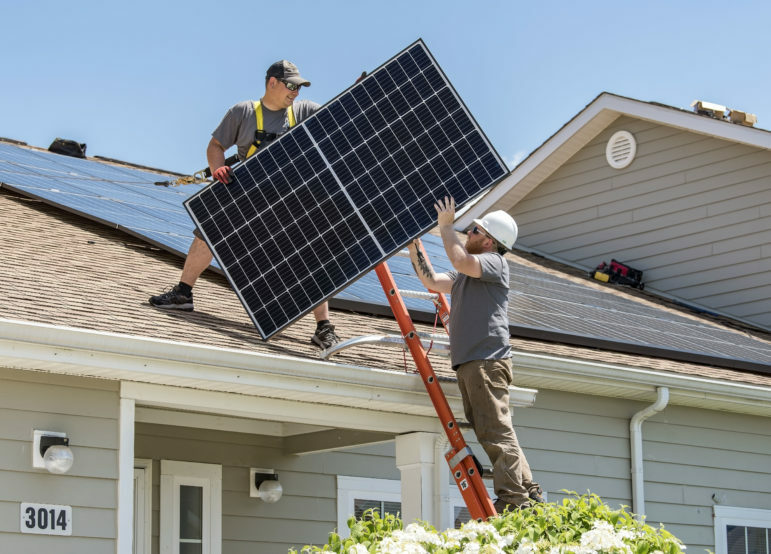 A Seattle tech company has created an online marketplace to connect renewable buyers and sellers. Xcel Energy has an aggressive clean energy goal. How will it get there? 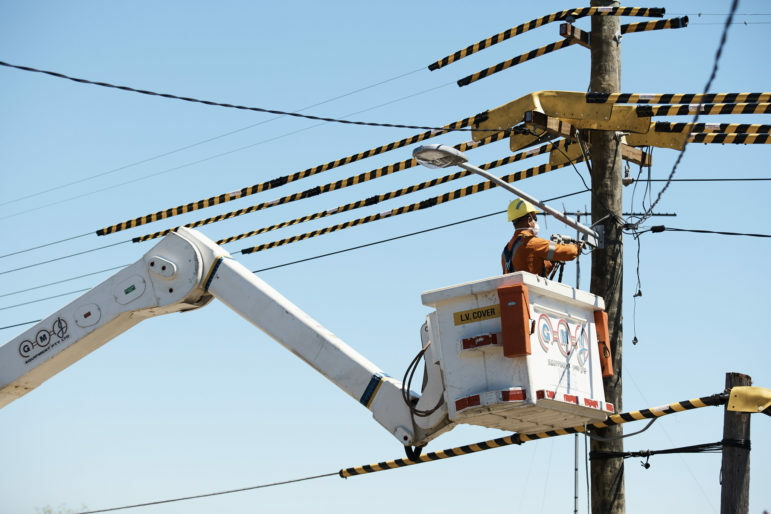 The utility says its interim goal of 80 percent carbon reduction by 2030 can be met with existing technology. With a collaborative approach, the center’s leader aims to foster the development of ambitious clean energy solutions.